There are number of ways to delete and remove unwanted objects from images. 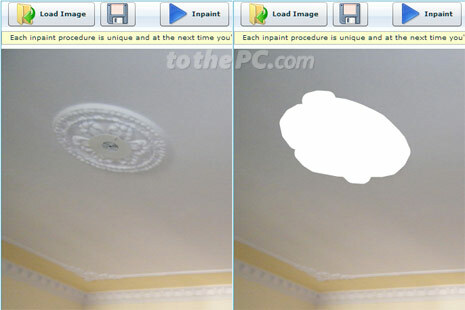 Content aware filter feature in Photoshop CS5 is an advanced and refined way to remove objects in a photo. Majority of users do not have time to learn expertise to use Photoshop. Fortunately, you can perform same routine of deleting objects from photos online within web browser without installting any software at ‘Web in Paint’ website. 1. Open Web In Paint tool in your web browser. 2. Click ‘Load Image’ button to browse and select image that you want to edit in this online tool. 3. Once selected images is loaded, use mouse pointer to highlight and select object in the photo that should be removed. 4. Then click Inpaint button to start processing for removal of selected object. Once processing is complete, you will see image without the selected object. 5. Then click Save button (next to load image) button to download edited image without the object(s). If you face issue opening downloaded image, add .jpg in the end of image name for proper image association. You may repeat above procedure on same image to remove and delete multiple objects in the photo using online tool at Web In Paint. Paid desktop version of this tool is also available for better results.